This is just an informational module – you can delete it on the template. We put this in to demonstrate that you can have almost any type of content you’d want within a “billboard” module type, whether it’s text, a CTA, or something else. It should be attention-grabbing, urging readers to either make an action, or keep reading (ideally, both at the same time). Ensure your mission critical success. With 40 years of experience designing and equipping mission critical operations, EVANS is your strategic advantage. Experience in more than 15 diverse industries. Make sure every detail helps you achieve your bigger goals. Solutions that provide a good return on investment. Invest in solutions that are future compatible and built to last. Consoles that ensure operator comfort and efficiency. Increase the capabilities of your space and performance. Your control room is the nucleus of your organization. Ensuring everything in it is operating at peak performance is mandatory for your success. Whether you’re in the planning phase of a new build or upgrading an existing space, you need a partner that can bring world-class thinking and solutions to the table. A partner that understands control room environments and is often at the forefront of setting industry-wide standards for that environment. A partner that can provide the best future compatible solutions for your business. And that partner is EVANS. 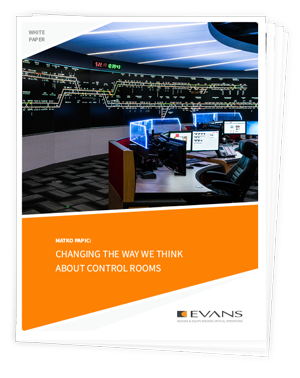 See how technology can impact how we adapt to evolving operational requirements in the control room environment.